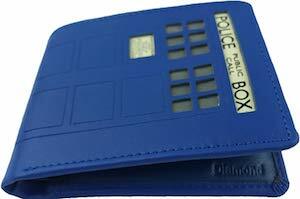 If you are a Doctor Who fan looking for a way to store cash or cards then you have to see this worn look Tardis wallet. This is a bifold Doctor Who wallet with on the outside a part of the Tardis with the doors on the front with the windows and many signs and it looks a bit worn to make it look even better. On the inside the Tardis wallet is blue and it has the Doctor Who logo in white and there are lots of card slots and a pocket for your cash. Now you can always have the Tardis near close to your credit cards and cash. Now there is a cool Tardis women’s wallet for all the true Doctor Who fans that need a place to store their cash and cards. The Tardis wallet offers plenty of space for cards on the inside and those can be bank cards but loyalty fit perfectly too. And besides card there is a zip up compartment that can hold you coins and bills. 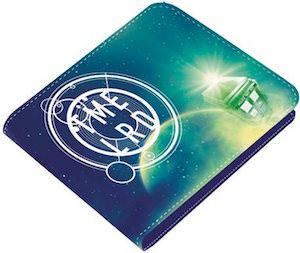 On the outside the wallet shows a cool image of the Tardis and it has some cool double image things happening that gives you the feeling that it is moving. Beside the Tardis it has the Doctor Who logo embossed in it and it even has the BBC logo on it. 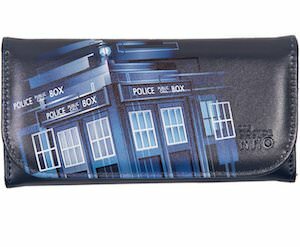 This Doctor Who wallet is great for storing your cash and cards and it looks better than most plain wallets that people use. 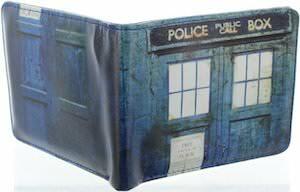 This bi-fold wallet ahs a green and blue color with on it a galaxy far away with a planet and the Tardis. Beside that there is in big letters the text “Time Lord” on it too so that everyone knows it belongs to the Doctor or his friend. Made from faux leather you know this wallet did not harm animals and that makes it perfect for all the Doctor Who fans that need to store money and cards while on the go. Now you can have a Doctor Who wallet to store all your cash and cards in. This wallet is blue on the inside and on the outside it shows the Vincent Van Gogh painting of the exploding Tardis. This Bi-Fold wallet offers space for cards and cash so that you can have the Doctor near to your money. The Doctor Who Tardis wallet also offers a clear pocket so that you can show you ID card without having to remove it from your wallet. Why would anyone want a plain wallet when you can have something cool like this?